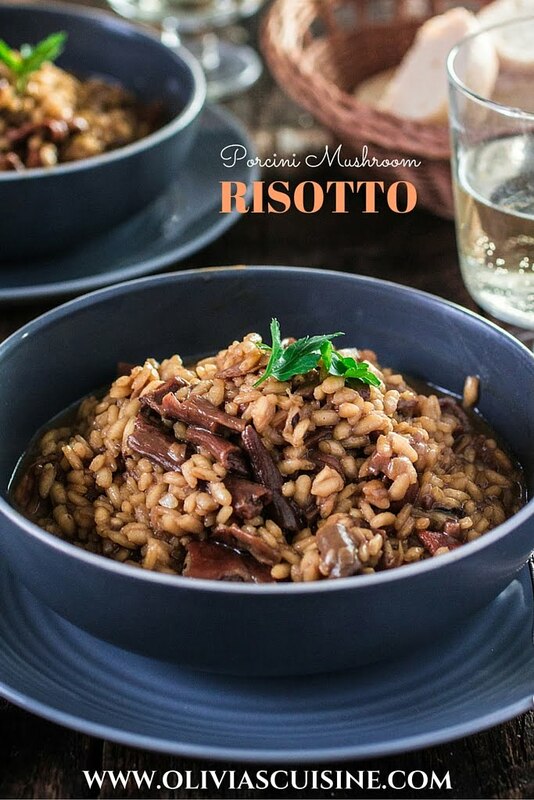 This year, I’m treating my valentine to a luscious and delicious Porcini Mushroom Risotto! While the whole internet is obsessing with everything red and pink, here I am, focusing on something else entirely: the actual meal you get to serve for your Valentine’s Day dinner. I don’t know about you, but I’m usually more excited for dinner itself than all the chocolate and cupcakes. Don’t get me wrong, I’ll gladly eat those too. But PLEASE FEED ME GOOOOOOD before you spoil me with candy! For me, Valentine’s Day is all about the romantic candlelight dinner. Taking the time to sit at a beautifully set table with my husband, savoring good food and celebrating our love. The only problem is that I usually work on Valentine’s Day. Because of that, those elaborate “all day in the kitchen” meals just don’t cut for me on this occasion. So it’s either 1) let my husband be in charge of dinner and risk having to eat unseasoned gray steaks (he doesn’t heat the pan long enough for the meat to brown) or 2) find something delicious to make that won’t take me more than one hour in the kitchen so we actually have time to enjoy each other’s company. We usually choose number 2! Every year I end up creating some sort of risotto for Valentine’s Day. Last year, I did a Gorgonzola risotto that I served with filet mignon and, boy, that was a HIT! I have also shared recipes for a Fresh Tomatoes and Arugula Risotto, which is one of the most popular posts on this blog, and one for Collard Greens and Italian Sausage Risotto that is to die for. Can you tell I love risotto? ? Not only it is a simple and easy dish, but there’s something undeniably sophisticated and romantic about it! 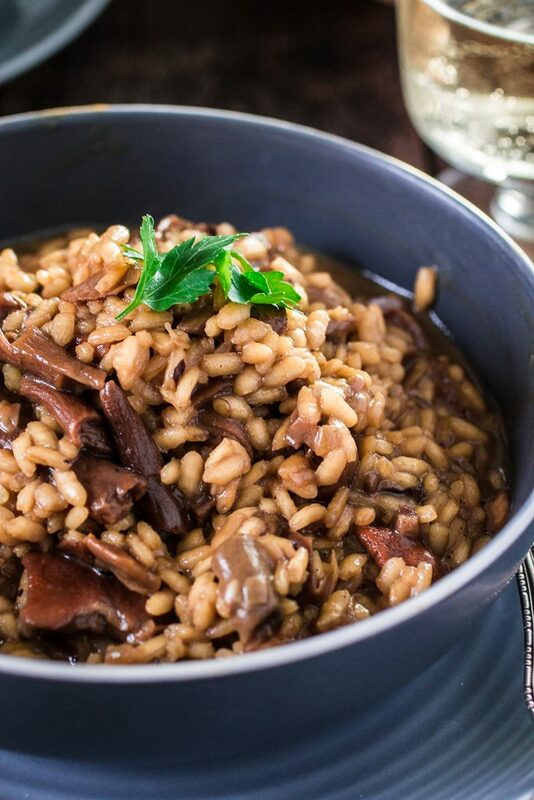 This year, I’m going with porcini mushroom risotto. I had been planning on sharing this recipe here on the blog for a long time. It is one of my Italian aunt’s staples and she serves it for every major occasion. It also fits perfectly with my newly obsession: mushrooms. Don’t judge me, but it was only recently that I started appreciating mushrooms. In fact, if I could go back in time and tell my mushroom loathing self that one day I would be drooling over that stuff, she would probably laugh at my face and call me crazy. That’s a pity, because she could have enjoyed 30+ years of Aunt Luiza’s Risotto ai Funghi. Oh well, I guess it is never to late to embrace a new passion, right? However, this newly discovered love for mushrooms is still pretty much conditional to lots of butter and/or wine. Good thing this mushroom risotto has both! A fair warning, though: dried porcini mushrooms can be a little pricey. If it’s just not in the budget, go ahead and substitute for whatever mushrooms you can afford. But, if you can splurge (or find more affordable porcini somewhere), I highly recommend you use them if you’re making this recipe. They are very delicious and their strong nutty flavor really makes this dish outstanding! Not to mention they have a high protein content, which means you get to serve this risotto as a main dish if you want. If you like food history like me, you’ll find interesting that Porcini mushrooms were really popular in Ancient Rome and aristocrats devoured loads of them at their feasts. They liked mushrooms so much that they called it “food of the gods” and even crafted laws prohibiting commoners from eating them. However, given that some mushrooms can be deadly, the Romans took care not to poison themselves by hiring experienced mushrooms foragers and daring food tasters to assure that the fungal bounty was safe to eat. As much as I love mushrooms now, I don’t think someone could pay me enough to be a wild mushroom tester. I’ll stick with buying safe mushroom that comes from the grocery store, thank you very much! ? Anyways… I hope you guys enjoy this mushroom risotto as much as we did! Start by thoroughly rinsing the dried mushrooms, to get rid of any grit. Place the mushrooms in a bowl and cover them with water, gently pushing them so they are submerged. Let them soak for 1 hour or until they are soft. Remove the mushrooms from the liquid , squeezing them lightly to remove any excess water, and transfer them to a chopping board. Roughly chop the mushrooms into smaller pieces. Reserve. Place a strainer over a saucepan, line with paper towel and pour the soaking water, allowing the mushroom water to drain through. Discard the paper towels. Add the beef broth to the mushroom water and bring it to the stove, over medium heat, until it starts to boil. Then, lower the heat and keep it simmering until ready to use. Heat the olive oil in a large skillet, over medium heat. Add the shallots and sauté until translucent, about 2 minutes. Add the rice and stir for about a minute, until it is well coated and opaque. Then, add the porcini mushrooms and stir to combine. Stir in the wine and cook until it is nearly all evaporated. When the rice is al dente, add a little more liquid to keep the risotto moist and then remove it from the stove. Add the butter and the parmesan cheese and mix vigorously, being careful not to break the grains and mushrooms. 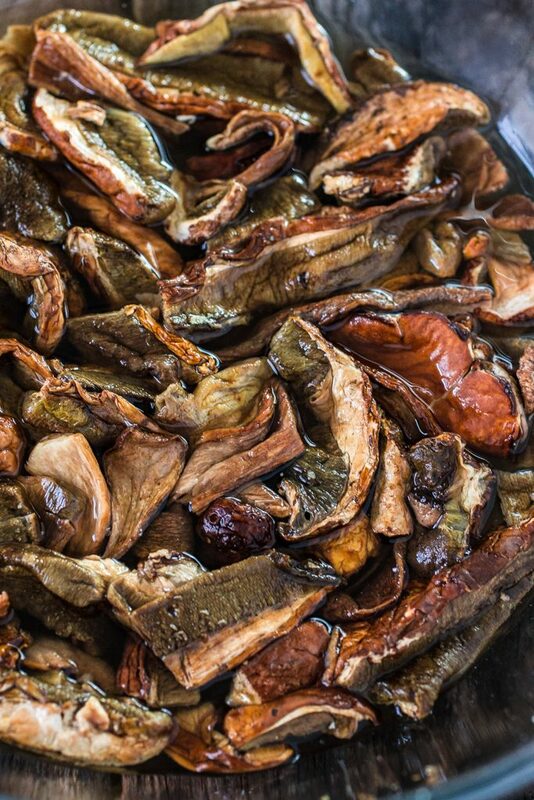 If you're in a hurry, you can rehydrate the mushrooms faster by soaking them in hot water. They will soften quickly but will lose some of their flavor.